Ashley Burkett struggled to regain her balance while she worked to haul in dredging equipment as 10-foot waves tossed the research vessel in the Gulf of California. It was all part of gaining oceanographic research experience. Burkett, an Indiana State University graduate student, recently spent two weeks with Scripps Institution of Oceanography scientists aboard the RV New Horizon on a journey of science. Jared Kluesner, chief scientist for the expedition, selected Burkett to work onboard the vessel to give back to his alma mater, ISU. Kluesner graduated from the geology undergraduate program in 2006 and then received a scholarship from Scripps to begin his doctoral work. When Kluesner first started doing research at ISU, he was given the opportunity to go on a 24-hour student research cruise in San Diego. "Personally, I am a very visual learner," Kluesner said. "The student cruise provided me with the visual context I was craving and sparked my interest in science." Tony Rathburn, associate professor of geology, gave Kluesner experiential learning opportunities throughout his studies at ISU. "As an ISU undergraduate, Jared benefited through the hands-on experiences on international expeditions, and now that he is in charge of a research expedition, he is giving back to the program," Rathburn said. "There is limited space on the ship, so Ashley's spot on the ship is highly valued." Kluesner agreed with the impact of trips and research. "In my experience, experiential learning is key in helping students understand scientific processes in a visual context," Kluesner said. Burkett began working on her master's degree in geology at ISU in August. The Toledo, Ohio-native received her undergraduate degree from Muskingum University in New Concord, Ohio. "Each graduate student works with a professor and I work with Dr. Rathburn so this is how I was given the opportunity for this trip," Burkett said. "I was surprised that I was selected for this trip so early in my studies because usually you have to work in a lab performing research before you are rewarded with opportunities to actually go collect samples yourself." The expedition departed on Oct. 2 from the Nimitz Marine Facility in San Diego, Calif. and made port in Mazatlan, Mexico on Oct. 13. "This rare international opportunity is coming at an ideal time in Ashley's career, and experiences from this expedition will provide her with excellent training and exposure that will enhance her knowledge base and expand her abilities and professional connections in marine science," Rathburn said. Burkett explored the Gulf of California and studied the geological process at work in the region. There, the seafloor is slowly rifting apart as new ocean crust emerges through volcanoes and other underwater features to form a new ocean basin in the Pacific. The separating mainland Mexico from Baja California, where this gulf is located, is one of the few places on earth where scientists can actively study the birth and formation of an ocean basin because it is currently going through the transition from continental rifting to seafloor spreading. This gulf has been widening for the past 15 million years. The southern extent of the San Andres fault system meets-up with the northern end of the Gulf. As many more years pass and the ocean floor continues to rift, the gulf will turn into a vast new ocean. "We took dredges of the faults with a big metal basket-type device that scraped along the steep fault to collect rocks," Burkett said. "Ashley was key in deploying and recovering the rock dredges, a job which requires constant attention and physical/mental ability," Kluesner said. Aboard the 170-foot-long research vessel, there are state-of-the-art research instruments to study marine life, the oceans, the seafloor and the atmosphere. This vessel contains more than 1,200 square feet of research space. "My favorite part of the research would have to be the pockmarks because there are multiple explanations for why they form," Burkett said. "Pockmarks occur when fluid comes up through the ocean floor and sediment can't settle there so it creates a crater-like hole." Pockmarks can be pictured by thinking of the moon's appearance with its many craters. Just west of Baja California and within the Gulf, pockmarks can be more than a kilometer across and hundreds of meters deep. Kluesner introduced Burkett to this because he is very interested in how these big holes form. "It was exciting to learn about them and see them on the seismic images," Burkett said. "Participating in the pockmark investigation was exciting and interesting." The main objective besides researching the pockmarks was to gain a better understanding of the geology of the floor in the Gulf of California. 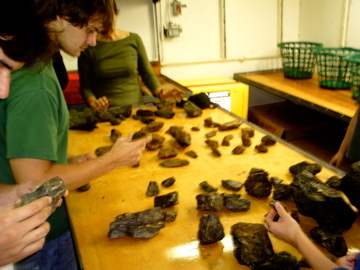 The dredges pull up igneous rocks that the scientists study to determine ages of the rifting faults and associated magmatism. "I didn't get to do much rock identification, but it was neat to ask the Mexican scientists what was going on with the rocks," Burkett said. Before the expedition took off, Kluesner set up a Web site that included an interactive blog, images, maps and a tracking system that allowed students and teachers to interact with the scientists while they were gone. "This experience gave me a heads up on what it is like to work on a research vessel," Burkett said. "I am really glad I did this, even though I was nervous, because it prepared me for later research experiences, including the research cruise in Costa Rica early next year." "I hope that this research cruise experience helped spark her interest in science, as it initially did with me," Kluesner said. Burkett will spend one week with Rathburn and other scientists on a cruise to Costa Rica this upcoming January to do research for her thesis. "I am happy that ISU provides me and other students with these types of experiences," Burkett said. "I believe that my participation in this trip has added greatly to my development as a researcher." 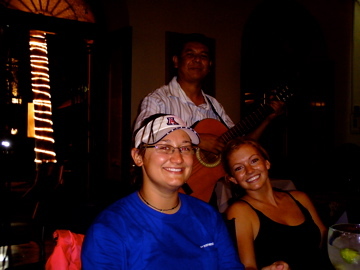 Cutline: Ashley Burkett, Indiana State graduate student, takes time to relax with a teammate from the cruise. Courtesy photo. Cutline: Jared Kluesner, Indiana State alumni and doctoral student at Scripps Institution of Oceanography, examines rock specimens dredged from rifts in the Gulf of California. Courtesy photo. Ashley Burkett, an Indiana State University graduate student, recently spent two weeks with Scripps Institution of Oceanography scientists aboard the RV New Horizon.